The XTC song linked just before TNT's summer break in observation of late goings on in Nice and Turkey got me to thinking about records that have captured the sounds of warfare. Naturally, such musings lead directly back to World War I, "The Great War," "The War to End All Wars." World War I may have been "The War to End All Wars" in exactly the same way that the Titanic was "Unsinkable," and many of its innovations may have appeared in embryonic form during the American Civil War fifty years earlier, but it did mark the widespread transition to modern industrialized warfare. I'm sure, with all the centenary observations, most of us have seen rare footage of the conflict and its many contributions to our modern sense of safety and security: aerial combat and aerial bombardment of civilian centers; armored, mechanized ground forces; rapid-fire automatic weapons, including the admittedly imperfect granddaddy of what would eventually become the modern "assault rifle"; heavily armored, all-big-gun naval vessels; high-speed mechanized transportation supplying men at the front; submarine warfare; poison gas. But what did it sound like? World War I has another, rather more benign distinction: it was the first conflict of consequence after the perfection of mass produced sound recordings, meaning for the first time we might get a sonic snapshot of the horrors taking place on its battlefields, something that captures a moment in sound the way all those photographs and short films capture a moment in sight. And, sure enough, one famous record exists whose stated intent was to do exactly that. Titled "Gas Shell Bombardment," it was recorded in October 1918 and, according to the label, preserved the sounds of the Royal Garrison Artillery firing a barrage of gas shells at the German lines. HMV recording engineer William Gaisberg--brother of pioneering record producer Fred Gaisberg, who about 15 years earlier had defied company brass to sign a young Italian tenor named Enrico Caruso to record for HMV--personally traveled to the front with a bulky, primitive recording apparatus for this pioneering exercise in on-location recording. The result was not ready for market until after the war ended, too late to promote the sale of war bonds as had been originally intended, and therefore was released as a benefit for injured war veterans instead. It remained in the catalogue for decades thereafter. I've never owned a copy of "Gas Shell Bombardment" myself, but I've heard dubs, and I'll confess it's an odd sounding artifact. The whine of the flying shells, in particular, is distinctive and peculiar; one source describes the effect as "reverse Doppler." In all events, something about it has always bothered me: knowing how difficult recording by the acoustic process was, how many heroic measures (right down to modifying the design of the instruments) were needed just to get a piano or violin to "register" in a small, enclosed studio, and how difficult is even today to get anything like passable sound in an outdoor venue, I wondered just how those early recordists had managed to capture all those sounds of soldiers calling orders, gun actions cycling, and the like. Turns out I did well to wonder. Evidently, modern analysis has determined the record is a product of heavy, and for its period amazingly skillful, studio manipulation, with all manner of sounds being overlaid on the guns' reports, which can be heard in a latterly discovered alternate take without the other "atmospherics." Now, I know the temptation is there to sniff at the "naivite" of our forebears who swallowed this thing whole. Before you do, though, consider this: The recording, if fabricated, must have been well fabricated; more than one presumably knowledgeable individual vouched for its realism. For example, one discussion of the recording on line tells us of efforts to study the record in the late 20th century: "A promising auditory witness was located: 95-year-old Lt.-Col. Montagu Cleeve, another former artillery officer, in his time a developer of 'Boche Buster' railway gun, later a music professor – was invited to critically assess the recording. Cleeve vouched unreservedly for its authenticity. He heard in it, he said, an unmistakable succession of sounds – the clang of the breech, the gigantic report of the firing explosion, the distinctive whiny whistle of a gas shell on its way across no-man's-land." (https://soundstudiesblog.com/2014/07/07/listening-to-traces-of-war-gas-shell-bombardment-1918/) On the other hand, I've never heard of anyone from the period, when presumably the reality of those sounds would have been indelably burned into the memories of former combattants by the thousands, calling it out as misrepresenting their recollections. A sonic oil painting by a skilled portraitist, then, rather than a sonic snapshot. But more: consider that we today willingly accept exactly the same sort of sonic trickery without a second thought. How many evenings have you spent, as the commemorations of World War II have flooded every TV tube known to man, deeply immersed in the blasts of field artillery and deadly high-explosive bombs pulverizing helpless cities under siege, the roar of powerful warbirds tearing into the air followed by the rattle of their guns as they desperately oppose incoming bombers or engage deadly opposing fighters, the deafening thunder of naval artillery hurling massive shells at enemy ships on the horizon or fortifications on some God-forsaken beach where we will soon see swarming men crumpling under a rain of chattering machinegun fire? From a sonic standpoint, fake, most or all of it, all or nearly all a product of Hollywood production studios, married to authentic images long, long after the fact. Think about it. Gun cameras were incorporated into aircraft for the practical purpose of evaluating effectiveness and facilitating improvement of the weapons; leaving aside the practical problems of getting useful output from microphones exposed to multi-hundred-mile-per-hour airstreams, there was no need for sound, and no sane aircraft designer would bother with the bulky, fragile, heavy, power hungry tube electronics necessary for any sound recording at that time; indeed, at the beginning of the war, those drawbacks meant even so seemingly vital a piece of gear as the radio was by no means universal. Similarly, portable movie cameras carried by the combat photographer or common soldier would be small, spring-driven boxes with no electronics or heavy batteries, and hence no sound recording capability. Still, with the advent of the microphone it was only a matter of time before war sounds would begin cropping up, or purportedly cropping up, in places where they were not expected or wanted. Onward, men! Once again, into the audio breach! In the years leading up to what most of us outside the Iberian Peninsula consider the beginning of World War II, a particuarly nasty prelude raged across Spain as Generalissimo Francisco Franco's Nationalists sought to seize control the the country from a weak elected government represented by a mix of fighters known as the Republicans. The Spanish Civil War was in many ways what we today would call a proxy war, as Germany and Italy funneled support to the Nationalists and the Soviet Union and a mishmash of foreign fighters known as the "International Brigades" sought to prop up the Republicans. Among those International Brigades was a cadre of anti-Nazi Germans, opposed to the German government's official endorsement of Franco, who included one Ernst Busch, a songwriter and singer who had and would continue to have significant success in musical theater of the day. 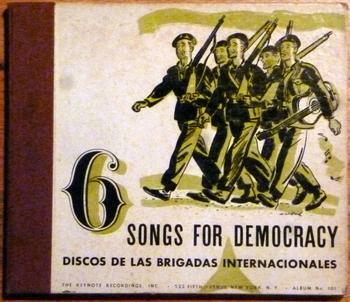 Doubtless through his influence, he and his companions recorded a group of songs that eventually achieved issue in the United States on the tiny Keynote label as "Six Songs for Democracy," dubbed from records originally released on a European label. No less than Paul Robeson wrote the introductory notes in the accompanying booklet: "Here are songs recorded during heavy bombardment, by men who were themselves fighting for the 'Rights of Man.' Valiant and heroic was the part played by the International Brigade in the glorious struggle of the Spanish Republic. I was there in the course of that struggle and my faith in man - in the eventual attaining of his freedom - was strengthened a thousand fold. This album helps sustain that faith. It's a necessity. July 4, 1940 Paul Robeson." (All of which calls to mind a line from Tom Lehrer's "The Folksong Army," who knows, maybe even inspired by this set: "Remember the war against Franco/That's the kind where each of belongs./They may have won all the battles/but we had all the good songs.") Famously, in at least some releases one of the Keynote sides carried a label reading as follows: “The defective impression of this record is due to interruptions of electric current during an air raid.” War just doesn't intrude on an issued recording much more than that. Or does it? Generations of record buyers and 78 collectors have taken that disclaimer at face value, beginning with David Hall, who in The Record Book (1940 edition) wrote the following: "It is more than a little interesting to note that the defect in the recording of 'Song of the United Front' was the result of interrupted electric power caused by a bombardment of Barcelona then in progress. 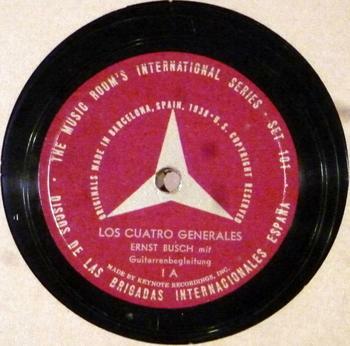 It is needless to say that the singing of Ernst Busch and the group of his fellow International Brigadiers carries terrific intensity and conviction with it, and that these are among the most extraordinary discs ever to reach these shores (they had to be smuggled out of Spain after the Civil War was over." Information has come to light more recently, however, that calls the records' direct battlefield credentials into serious question. It should be noted that, stickers on the labels and Robeson's romantic recollections notwithstanding, the booklet accompanying the records claimed only that wartime conditions had complicated their production: "How often did the recording or manufacture have to be interrupted because Franco's bombs were crashing down on Barcelona or the supply of electricity was cut off!" Then there's the testimony of a book--oddly enough, about children's records--regarding how the records were produced for Keynote: they were dubbed from commercial pressings of a larger set smuggled out of Spain by an American soldier, and by the time they reached Keynote one was cracked. To dub the damaged disk, Keynote's remastering producer, on advice from Decca engineers, heavily coated it with Vaseline and played it back with a heavy pickup. (David Bonner, Revolutionizing Children's Records: The Young People's Records and Children's Record Guild Series, 1946-1977, Lanham, Maryland: Scarecrow Press, 2008.) The sole battle causing audible defects, then, was that of the recording engineer against a cracked dubbing source. My own experience, alas, is in keeping with this explanation. I own a copy of the set, abeit without the label sticker, and the side in question shows no signs of the sorts of defects one would expect from a power outage caused by bombardment. It's too badly worn and noisy in its own right to make out the telltale clicks of a cracked source record--Keynote pressings were gritty, brittle things even at their best, and my copy has definitely seen better days--but it's still clear enough to know that no explosion is to be heard, even faintly via headphones, in the background. 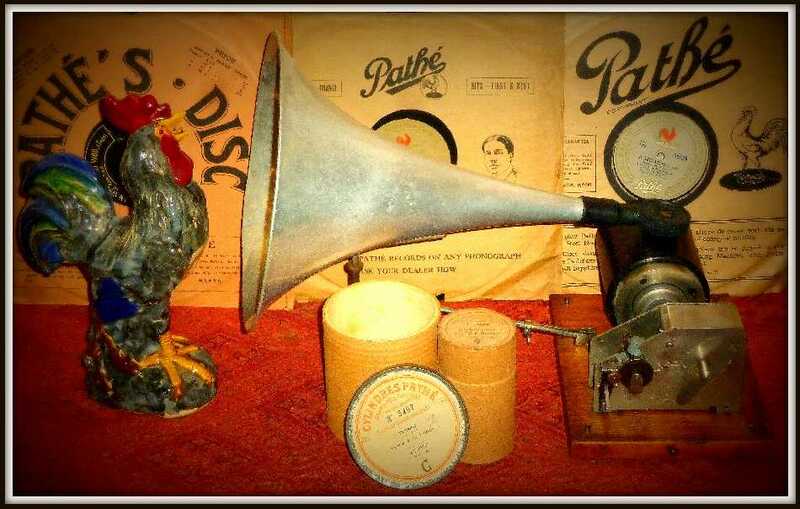 Moreover, there is no speed fluctuation or even discontinuity in the music as one would expect if the power to a recording lathe and associated electronics had been interrupted. I'm forced to conclude the book is right: the claim of wartime disruption is no more authentic than the claim all those sounds on the "Gas Shell Bombardment" record were authentically recorded at the front, and those perpetuating the story of interrupted electricity are passing on something read, not heard. So if these two recordings, each making express claims to capturing the sounds of war, are fabrications, what records do live up to such claims? Two are known to me, one quite celebrated, the other, as far as I know, my own serendipitous discovery. Wanda Landowska--Domenico Scarlatti: Harpsichord Sonata K. 490 (L. 206) in D Major. Roman Polanski's movie The Pianist opens with an unforgettable scene: Wladislaw Szpilman attempts to forge ahead with his radio recital as German shells crash down on the studio, even as the engineer frantically bids him to evacuate. From what I've read, a bit of dramatic license, that: supposedly, although the real-life Szpilman was the last musician heard on Polish radio before the invasion, in fact it seems he had finished his recital shortly before the attack. (Incidentally, for those who are interested in hearing him, Szpilman did make records, both classical and jazz, which Sony reissued on CD some years back.) Still, art does in some way reflect life here: Szpilman may not have performed under bombardment, but another Polish Jew was captured on record in like circumstances. Sir Adrian Boult and the BBC Symphony Orchestra--Gustav Holst: The Planets. Now, for the discovery. If you do a Google search for Landowska and "anti-aircraft," you'll quickly turn up any number of references. Try "Boult Holst Planets warplane," however, and chances are you'll find only a couple of mentions--by this author in audio forums. Landowska's sonic brush with the sounds of combat came as the war was in its earliest days. Making something of an audible bookend to that conflict, the other such example known to me dates to near the war's end. In January 1945, the BBC Symphony Orchestra was in residence in its home away from home: the Corn Exchange in Bedford, to which the BBC had transferred about 400 musicians, engineers, and other staff in 1941, when first London and then Bristol became too unsafe for its public concerts and broadcasts. 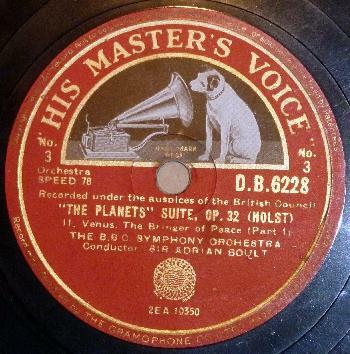 And so it was there that Sir Adrian Boult, who had led the premiere of Holst's The Planets years earlier, made his first of what would be five commercial recordings of the piece. Beginning what would become a "stereo demonstrator" tradition, the records were recognized as sonically spectacular immediately upon their release, and if they are no longer "state of the art audio," they still hold up pretty well even today. So well, in fact, that they inadvertently enshrine just the sort of war sounds, off in the distance, that we've been seeking. In a sense, I think, this recording of the first movement is a testament to the war still raging around it; the musicians, to my ear, bring to "Mars, the Bringer of War" a depth of personal experience that confers unique power. Where the war actually audibly intrudes, however, ironically is in the second movement, "Venus, the Bringer of Peace." Just before the 4 minute mark, if you listen closely through headphones, you can hear what clearly is a warplane flying over. The sound is faint, but it's definitely there. Care to go back in time for 30 seconds or so? Click the link below; it should bring you the segment in question and carry you briefly to a time when the sound of an airplane overhead was anything but routine background noise.